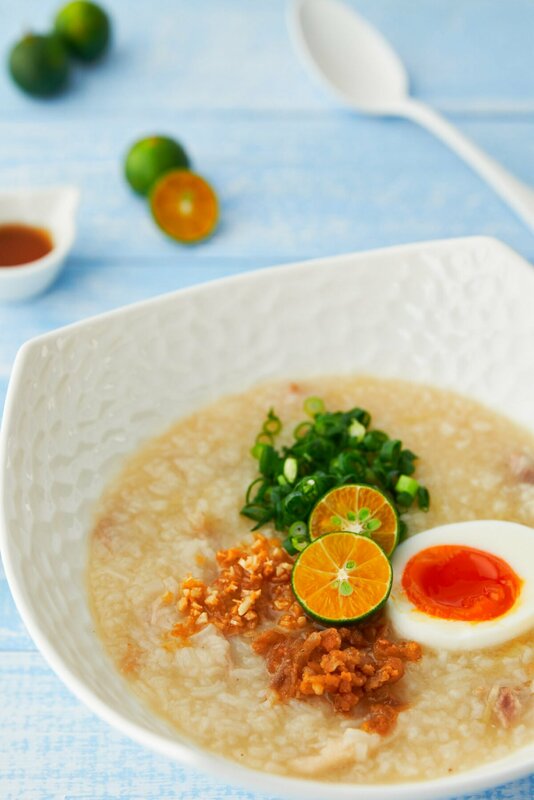 Arroz Caldo is a delicious Filipino chicken porridge made by cooking rice in chicken stock until it's thick and creamy. Redolent of ginger, and served with a sunny array of condiments such as Calamansi, boiled eggs, and crisp garlic, this classic comfort food is the perfect way to brighten up a dreary day, while warming you up from the inside out. Regardless of where you’re from, I think most of us can agree that there are few things more comforting than a steaming hot bowl of chicken soup. 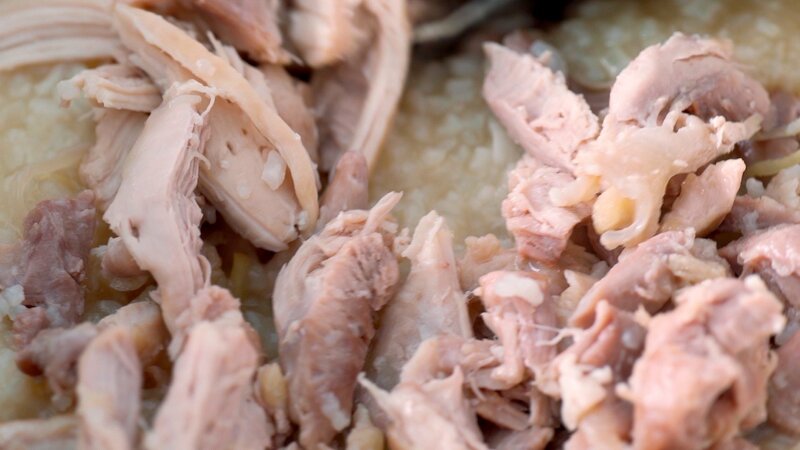 In the Philippines, they take this to the next level by adding rice to the chicken stock and cooking it until it turns into a thick porridge called Arroz Caldo. It’s a subset of a class of rice porridge dishes called Lugaw, and although the name Arroz Caldo is Spanish for “rice soup,” the dish is rooted in Congee, which was brought to the Philippines by Chinese immigrants. 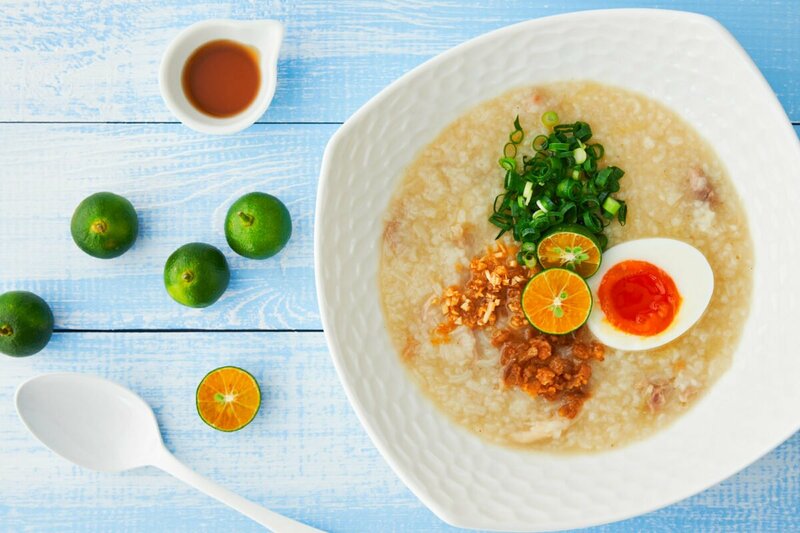 In the Philippines, this rice porridge is cooked together with chicken, onions, and ginger, which makes it far from bland, but what really makes this dish crave-worthy is the bevy of condiments which add bursts of vibrant colors, contrasting textures and complimentary tastes. While it’s possible to make Arroz Caldo using a whole chicken and water, I find that it takes far too long make, all in one go. That’s why I usually make huge batches of homemade chicken stock and store it in the freezer, so I always have some on hand when I need it. My favorite stock for Arroz Caldo is this Rich Chicken Stock recipe. As its name implies, it’s white and creamy thanks to the addition of chicken wings. The broth makes for an ultra-rich chicken porridge with a luxuriously silky mouthfeel thanks to all of the dissolved collagen. If you don’t have homemade chicken stock on hand, you can use canned broth, but it just won’t taste the same. If you do end up using store-bought broth, be sure to get one that’s low-sodium as the long cooking time, and the addition of other seasonings will make your Arroz Caldo too salty. The traditional rice to use for this is malagkit, which is long-grain glutinous rice, but to be honest, any rice you have on hand will work, as it’s cooked long enough for the rice to lose its shape. Chicken that’s been cooked to make chicken stock doesn’t make a great addition to anything as all of the flavor has been cooked out of it. I like starting with a fresh chicken thigh, which allows me to use the skin to make chicharron, and then I can poach the meat in the chicken stock until it’s tender enough to shred. I prefer using thigh meat because it won’t dry out as easily, but if you end up using chicken breast, you’ll want to cook it for far less time. Like most porridges, Arroz Caldo isn’t heavily seasoned, and the majority of the accents come from the addition of condiments. In terms of aromatics, I like to add a ton of fragrant ginger, as well as some onions, which contribute a mild sweetness. I also add a bit of patis(fish sauce) to amp up the umami, and some white pepper to give it a bit of mild heat. You can use black pepper, but I don’t like the dark specs it leaves in the porridge. Finally, a lot of recipes for this Filipino chicken porridge call for adding a yellow color to the dish using safflower, saffron or turmeric. 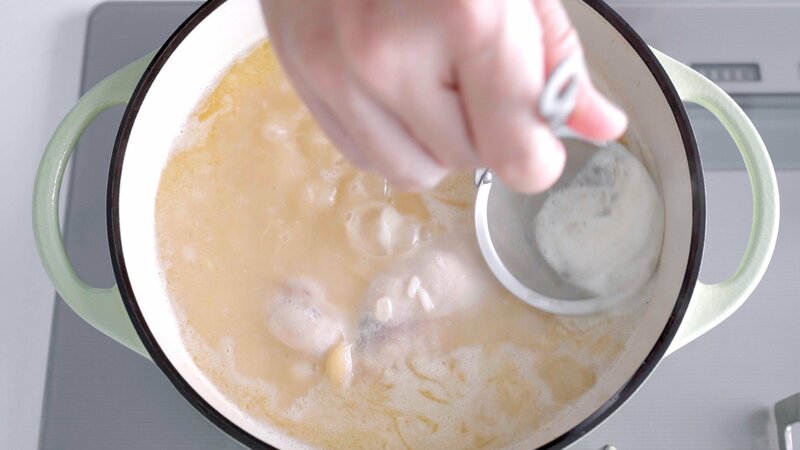 Although these ingredients add a sunny hue to the dish, I like to keep mine the natural color of the chicken stock, which allows the condiments to pop. At its core, Arroz Caldo is just thick chicken soup, and it’s the condiments that really make this dish compelling. Beyond being a way to personalize each bowl, the traditional condiments provide a variety of contrasting tastes and textures that keep the porridge from getting boring. 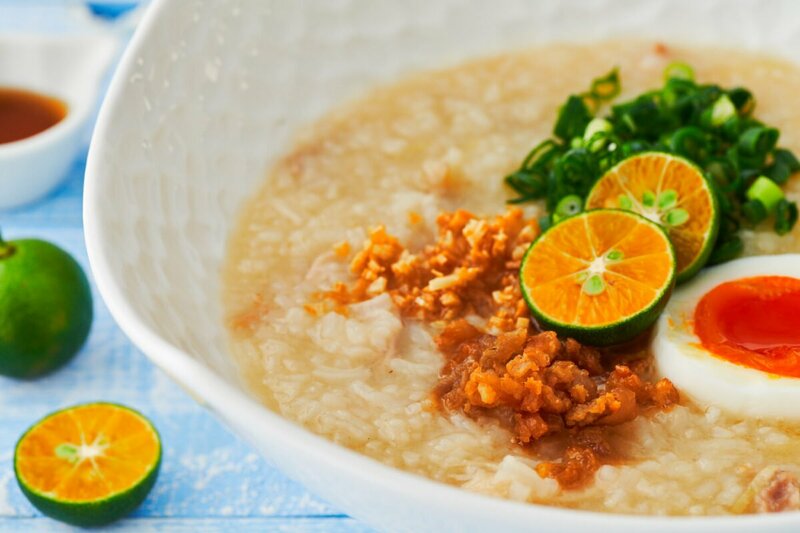 Calamansi – Many Asian porridges feature a ton of condiments, but what sets Arroz Caldo apart for me is the Calamansi. They’re about the size of a superball, and have thin green skin around yellowish-orange flesh with lots of seeds. 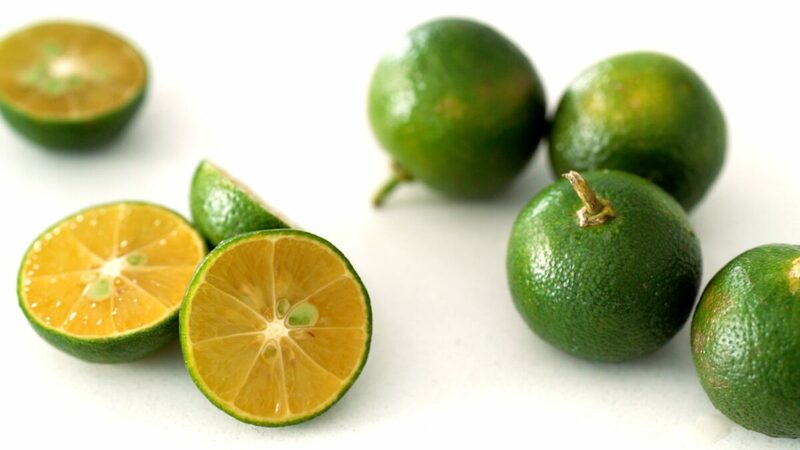 Calamansi is extremely fragrant and has a flavor that’s like a cross between green mandarins and limes. The taste is sour, but there’s also just a hint of sweetness that keeps it from getting quite as sour as a lemon. A squeeze of this citrus on top of the rich porridge provides a welcome fresh contrast that keeps your spoon going back for more. Unfortunately, Calamansi can be a little hard to find outside Southeast Asia, so if you can’t find it, you can substitute other tart citrus fruit such as Meyer lemons, yuzu, or limes. Egg – Hard-boiled eggs are the traditional choice, but there are a ton of options here. Slow cooked eggs, and poached eggs are excellent options, and if I’m feeling particularly lazy, I might just scramble in a raw egg into the porridge as I reheat it, which turns it into something like a thick egg-drop soup. Patis – Because Arroz Caldo is meant to settle the stomach, it isn’t heavily seasoned. That’s why it’s usually served with a side of Patis (fish sauce), so you can adjust the taste to your preferences. Fried Garlic – Adding fried garlic not only adds a crisp crunch on top, it also adds the wonderful flavor of caramelized garlic that’s reminiscent of Sinangag (Filipino garlic fried rice). Chicharon – Fried chicken or pork skins not only add an awesome crunchy texture, they impart a wonderful meaty umami to the porridge. Scallions – I think the main purpose of adding scallions is for the burst of color they provide, but they also contribute a nice oniony flavor and crisp texture that’s an important part of the experience. While these are the traditional condiments for Arroz Caldo, I think there’s plenty of room to be creative here. Some other options I like to add are avocado, fried shallots, and herbs such as cilantro and Thai basil. Because I start with chicken stock, the process for making my Arroz Caldo is pretty straight forward. I like to start things off by rendering out the fat from the chicken skin and then using that to fry the garlic to a crisp. 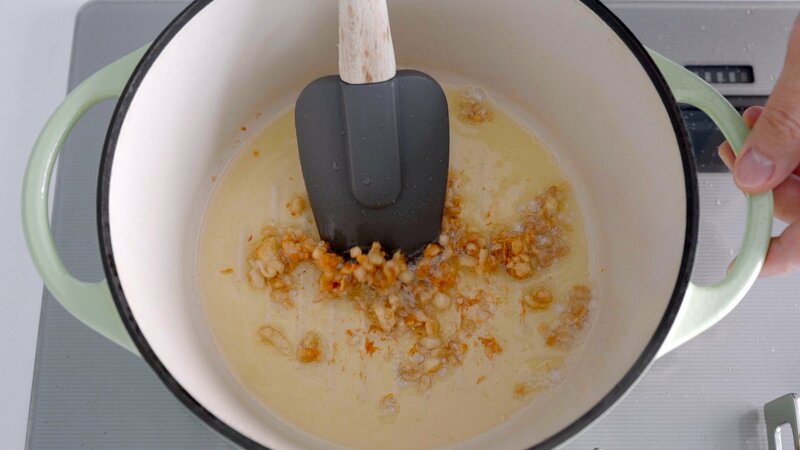 This also produces crisp chicken cracklins which can then be used as a topping. Some onions and ginger get sauteed in the remaining fat, and then rice, chicken stock, and seasonings get added. I also add some chicken meat to this and poach it just long enough so that I can shred it. Once it’s shredded, the meat gets set aside until the chicken porridge is almost done. 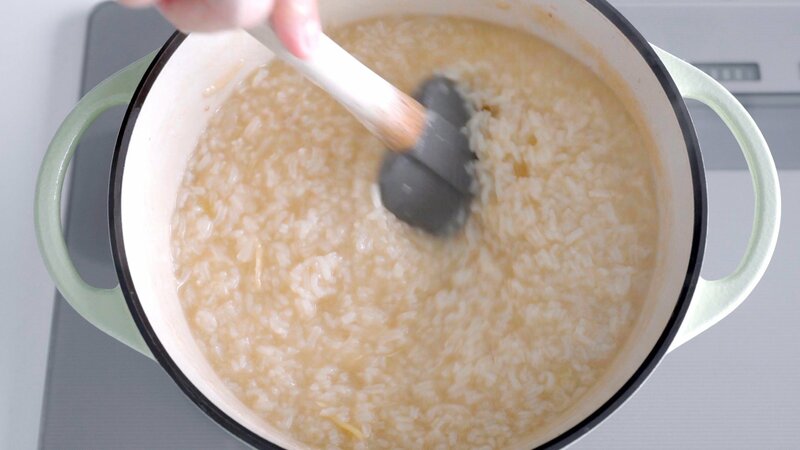 Then it’s just a matter of cooking the rice until it’s starting to dissolve into the soup, which takes about another 20-30 minutes. It doesn’t take a ton of effort to make Arroz Caldo, but it does take a bit of time, so I like to make a big batch and reheat it. Once it’s cooled to room temperature, you can store it in sealed containers for up to a week in the fridge. While I usually have no problem getting through a batch in a week, if you don’t think you can eat it all, you can divide it up and freeze it. 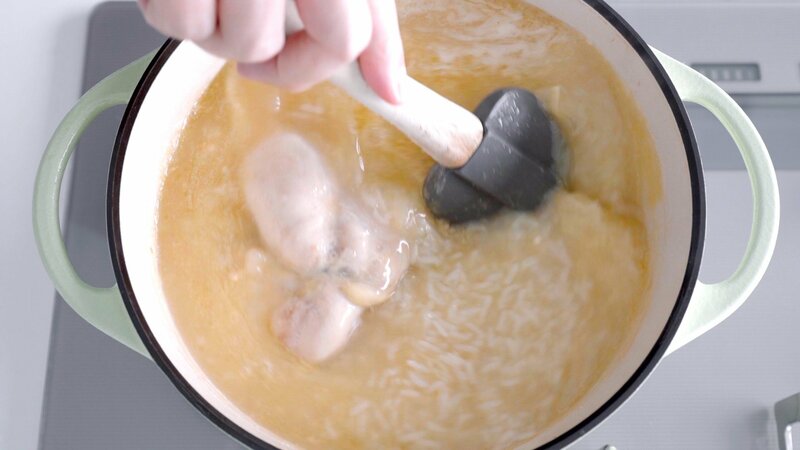 As for reheating Arroz Caldo, I recommend doing this in a pot. If it’s from the fridge, you can just add the amount you want to eat to a small saucepan, add a bit of water (it tends to get very thick when chilled), and reheat it over medium-low heat. Be sure to stir it regularly to keep it from burning. If you’re starting with frozen Arroz Caldo, I recommend defrosting it before attempting to reheat it. As for using a microwave, I don’t recommend it, as the porridge will heat unevenly and splatter. 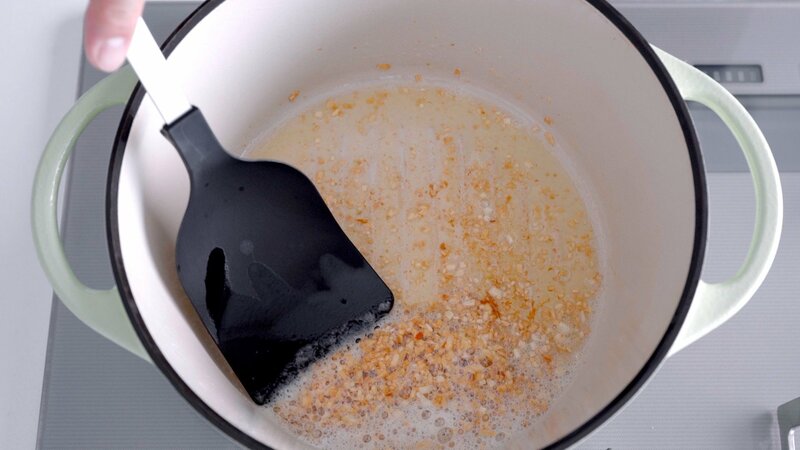 If you must to do it in the microwave, put the porridge into a relatively shallow bowl, cover it, and reheat it at a lower wattage (500-600 watts) for a longer (3-4 minutes). 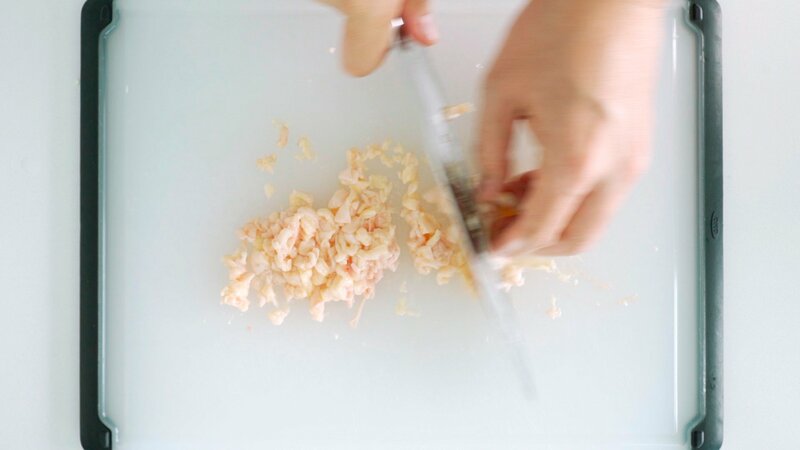 Remove the skin from the chicken and then mince up the skin. Add the chicken skin and oil to a heavy bottomed pot (such as a dutch oven), and fry over medium-low heat until the skin is golden brown and crisp. Transfer to a paper towel-lined plate to drain and set aside. 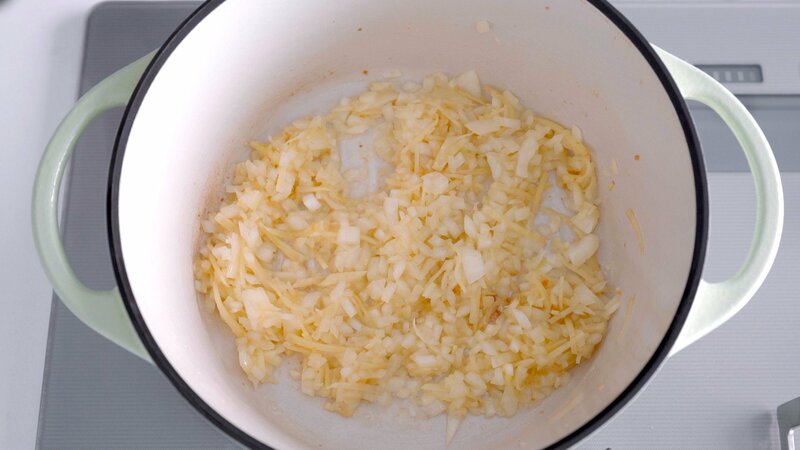 Add the minced garlic and fry until the garlic is light brown, and not sizzling any more. Transfer to a paper towel-lined plate to drain and set aside. Add the onions and ginger to the pot and fry until the onions have started to become tender (but not browned). 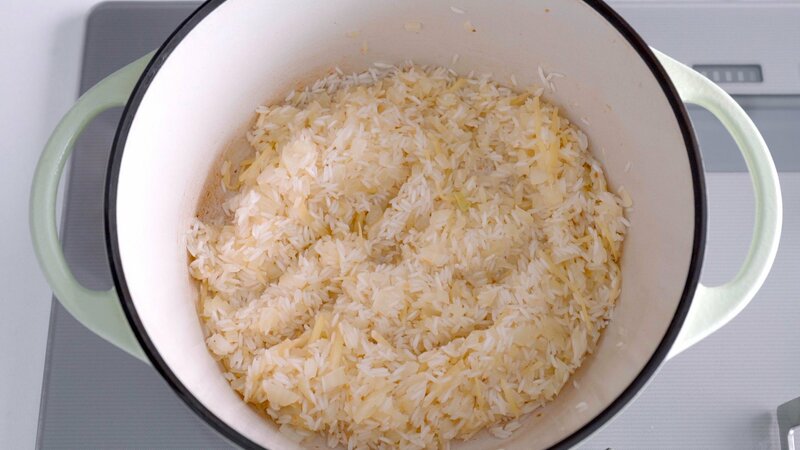 Add the rice to the pot and fry for about 30 seconds, to coat every grain with oil. Add the chicken stock, fish sauce, salt, and white pepper along with the chicken thighs. 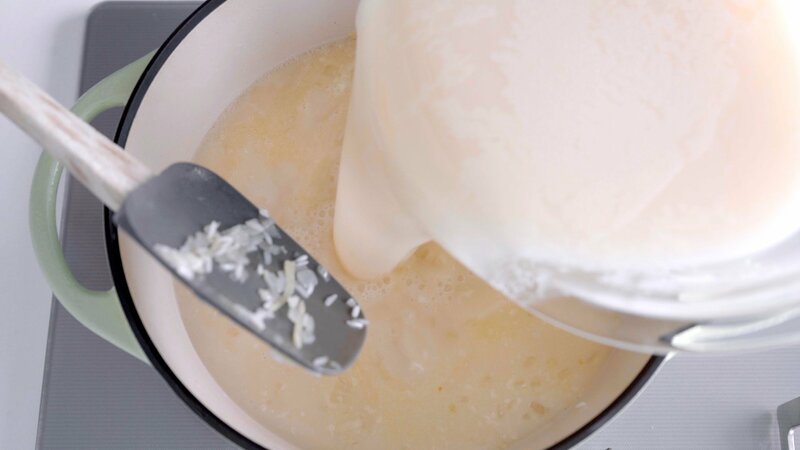 Bring the mixture to a boil and skim off any scum or fat that floats to the top. Turn down the heat to maintain a gentle simmer and cook the chicken until it's fall-apart tender (about 30 minutes). Be sure to stir this a few times to keep the rice from burning to the bottom of the pot. 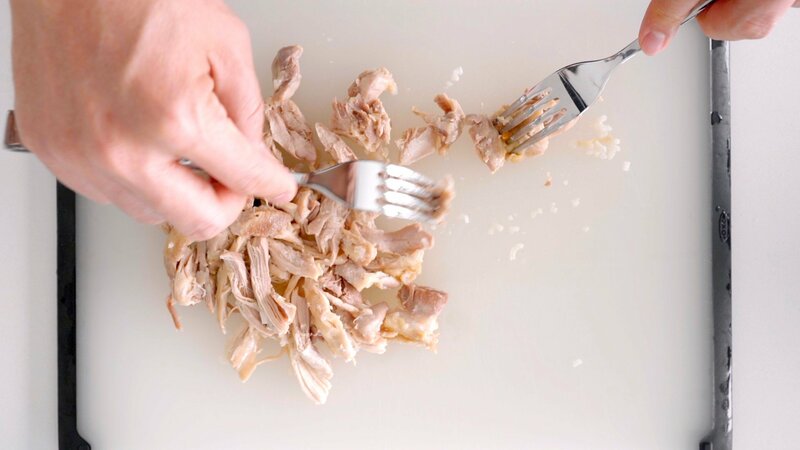 When the chicken is tender, remove it from the pot, and shred the meat using two forks. Keep the shredded chicken covered until the porridge is done. The Arroz Caldo should be starting to get thick at this point, so be sure to stir it more frequently to keep it from burning. When it is your desired consistency, the porridge is done. I usually let cook for another 20-30 minutes. This is a good time to prepare all your condiments. 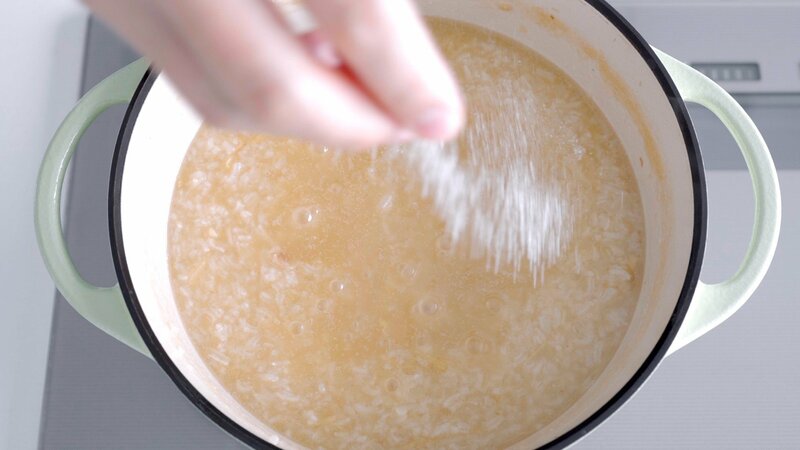 When the porridge has thickened to your liking, taste it, and add more salt if needed. Return the chicken to the pot and stir it in to reheat. 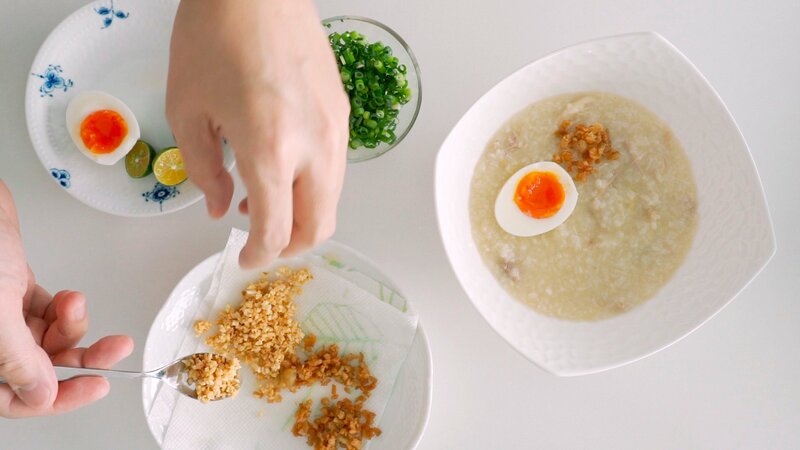 Serve the Arroz Caldo garnished with scallions, boiled egg, fried garlic, chicken cracklins, Calamansi, and additional fish sauce. Chicken feet arroz caldo paired with “tokwa’t baboy” is my favorite. Thanks for the post. Hi Mercy, thanks for stopping by! I’ve never had the two together, but I can totally see how they’d go together. The only thing is, when I see tokwa’t baboy it makes me want to have a beer! 🍻 I’ve never had Arroz Caldo made with chicken feet, but if I had to guess I’d say it’s probably pretty similar to this as I make the stock for this using chicken wings (has a similar cartilage and skin content to chicken feet, which makes it ultra rich). We have something similar in Puerto Rico and call it asopao (loosely translated “soupy”). Chicken, shrimp or crab are the most common versions but my mother used to make delicious bean ones. I have all the ingredients (except for the Calamansi 🙁 ) to make Caldo and looks like just the dish to weather polar vortex days here in NYC. Woohoo! Hi Judith, it’s so interesting how cultures around the world come up with similar comfort foods. As for the Calamansi, any tart citrus fruit can give you the same taste contrast (though it won’t have quite the same flavor), Meyer lemons are good option or if you can find them, sour oranges. If you enjoyed watching this, please let me know by heading to my YouTube Channel and giving this a like👍🏽, Subscribing to my channel, and leaving a comment to let me know what else you’d like me to make a video for. These videos take a ton of time to produce and hearing from you guys is the best motivation to keep me going!